Activation of dormant ovarian follicles to generate mature eggs. Although multiple follicles are present in mammalian ovaries, most of them remain dormant for years or decades. During reproductive life, some follicles are activated for development. 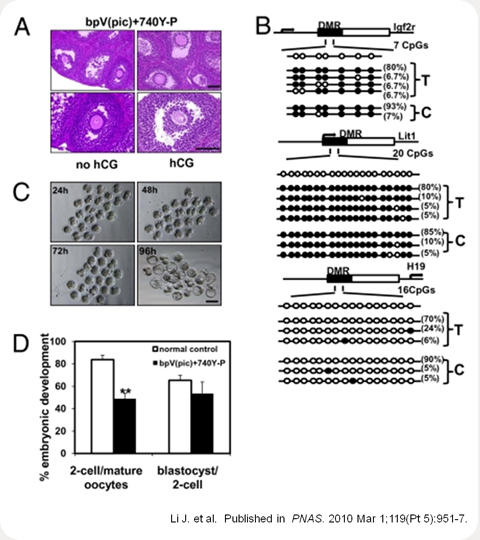 Genetically modified mouse models with oocyte-specific deletion of genes in the PTEN-PI3K-Akt-Foxo3 pathway exhibited premature activation of all dormant follicles. 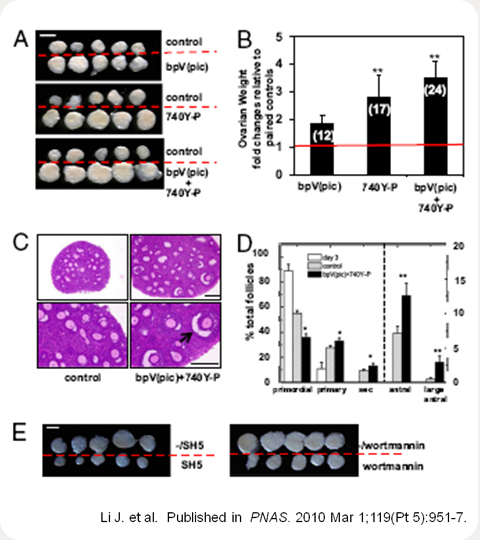 Using an inhibitor of the Phosphatase with TENsin homology deleted in chromosome 10 (PTEN) phosphatase and a PI3K activating peptide, we found that short-term treatment of neonatal mouse ovaries increased nuclear exclusion of Foxo3 in primordial oocytes. After transplantation under kidney capsules of ovariectomized hosts, treated follicles developed to the preovulatory stage with mature eggs displaying normal epigenetic changes of imprinted genes. After in vitro fertilization and embryo transfer, healthy progeny with proven fertility were delivered. Human ovarian cortical fragments from cancer patients were also treated with the PTEN inhibitor. After xeno-transplantation to immune-deficient mice for 6 months, primordial follicles developed to the preovulatory stage with oocytes capable of undergoing nuclear maturation. Major differences between male and female mammals are unlimited number of sperm and paucity of mature oocytes. Thus, short-term in vitro activation of dormant ovarian follicles after stimulation of the PI3K-Akt pathway allows the generation of a large supply of mature female germ cells for future treatment of infertile women with a diminishing ovarian reserve and for cancer patients with cryo-preserved ovaries. Generation of a large number of human oocytes also facilitates future derivation of embryonic stem cells for regenerative medicine. Li J, Kawamura K, Cheng Y, et al. Activation of dormant ovarian follicles to generate mature eggs. Proc Natl Acad Sci USA. 2010;107(22):10280-4. PTEN couples Sema3A signalling to growth cone collapse. Distinct changes in glycogen synthase kinase-3 (GSK-3) signalling can regulate neuronal morphogenesis including the determination and maintenance of axonal identity, and are required for neurotrophin-mediated axon elongation. In addition, we have previously shown a dependency on GSK-3 activation in the semaphorin 3A (Sema3A)-mediated growth-cone-collapse response of sensory neurons. Regulation of GSK-3 activity involves the intermediate signalling lipid phosphatidylinositol 3,4,5-trisphosphate, which can be modulated by phosphatidylinositol 3-kinase (PI3K) and the tumour suppressor PTEN. We report here the involvement of PTEN in the Sema3A-mediated growth cone collapse. Sema3A suppresses PI3K signalling concomitant with the activation of GSK-3, which depends on the phosphatase activity of PTEN. PTEN is highly enriched in the axonal compartment and the central domain of sensory growth cones during axonal extension, where it colocalises with microtubules. Following exposure to Sema3A, PTEN accumulates rapidly at the growth cone membrane suggesting a mechanism by which PTEN couples Sema3A signalling to growth cone collapse. These findings demonstrate a dependency on PTEN to regulate GSK-3 signalling in response to Sema3A and highlight the importance of subcellular distributions of PTEN to control growth cone behaviour. Chadborn NH, Ahmed AI, Holt MR, et al. PTEN couples Sema3A signalling to growth cone collapse. J Cell Sci. 2006;119(Pt 5):951-7. 740Y-P, is a cell-permeable phosphopeptide which activates PI 3-kinase, binding with high affinity to its p85 subunit. Activation of PI 3-kinase in turn inhibits PTEN, an important target in infertility drug discovery. Activation of the PI3K-Akt-Foxo3 pathway in oocytes and increased follicle development after treatment with bpV(pic) and 740Y-P. (A) Nuclear exclusion of Foxo3 in oocytes of primordial follicles at 6h after treatment with bpV(pic) and 740Y-P.
Retrieval of mature mouse oocytes for epigenetic analyses, in vitro fertilization, and early embryonic development. 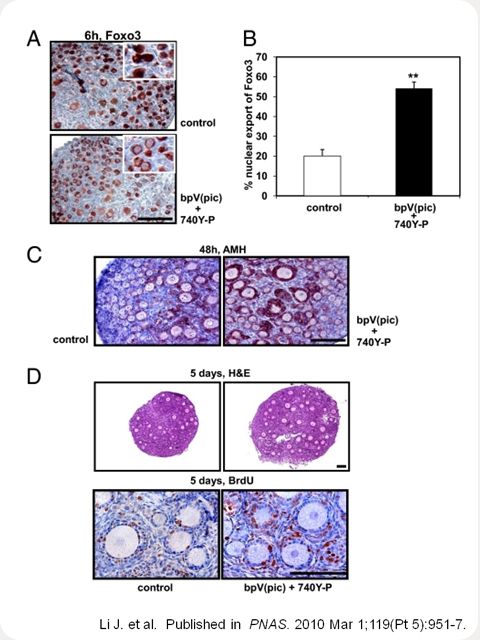 (A) Histology of ovaries with or without hCG treatment at 18 days after transplantation after pretreatment with bpV(pic) and 740Y-P.
Increases in PIP3 by activation of PI3K or inactivation of PTEN antagonises Sema3A-induced growth cone collapse. (A) Chick DRG explants were cultured overnight in the presence of NGF. Prior to application of Sema3A-Fc at 1 µg/ml, the cultures were incubated with the PI3K-activating 740Y-P peptide at 40 µg/ml for 30 minutes, with the 740Y-P peptide and LY294002 (10 µM), or with the Y-P-peptide 1309 (at 40 µg/ml).